Composite VS Amalgam—Which Dental Filling In Cocoa Beach Fits Best? If you’re getting a cavity filled, you’ll want to know what your options are. 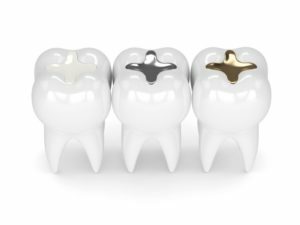 Amalgam (silver) fillings have been the norm in dentistry since the 1800s. But now, modern dentistry has introduced composite resin fillings that blend in with your natural teeth. They’ve surged into popularity because they offer a number of benefits that older solutions can’t. Read on to find out the pros and cons of each filling option and how they’ve advanced. Amalgams are still occasionally used today, but most dentists have switched over to more modern treatments like composite resin. Amalgam typically consists of a mixture of metals including mercury, silver, tin, and copper. Mercury comprises about half of the mixture and binds the other metal together to make the filling strong. Because it is combined with other metals, it is able to form a safe and stable compound. Because they’ve been around for so long, they have been proven to be effective and safe. They’re generally more cost effective than their composite counterparts. They typically last for about 10-15 years, so you wouldn’t have to worry about having them replaced frequently. Because they aren’t tooth-colored, they are noticeable when you open your mouth laughing or smiling. Some people have allergic reactions or are sensitive to the combination of metals that comprise the filling. Amalgam fillings can cause the surrounding tooth to turn a grayish color. Although your teeth naturally expand and contract when they come into contact with hot and cold substances, amalgams do this to a greater degree and can cause more cracks and fractures. Composite fillings have only been around since the 60s, and they didn’t become widely popular until the 1980s. Composite resin fillings are comprised of a mixture of ceramic and plastic. Because they are the same color as your natural teeth, they blend in well. They easily bond to the surface of your tooth. Since they are made of a flexible material, there is less drilling required, and they preserve the maximum amount of your tooth. Composite resin fillings only have a few downsides, which explains why most dentists prefer this more modern dental advancement. Because of the compound used, these fillings can typically take longer to place because of the process is more involved. Which Filling Option is Best For You? To choose which option is best for you, speak with your dentist, taking into account the size and location of your cavity. Also, discuss any cosmetic and medical concerns you may have. Your dentist in Cocoa Beach can offer you additional information on the difference between the two and why most dentists prefer the use of composite resin nowadays. Modern dental techniques have changed so they can offer you a functioning treatment that also looks natural. Dr. Gary Nawrocki has been treating patients for over four decades. He has completed a Mastership with the Academy of General Dentistry and has also completed advanced studies at the Spear Educational Institute. He chooses to dedicate his life to advancing his dental knowledge so he can provide his patients with the highest quality of care and experience. For any questions or to schedule an appointment, visit his website or contact him at 321-783-7514. Comments Off on Composite VS Amalgam—Which Dental Filling In Cocoa Beach Fits Best?